Okay, I think this was my single. favorite. thing. in the entire CB catalog. I want one. Bad. The minute we need another dresser, this is what I'm after! Or maybe I'll whip one up to use as an entertainment console in the basement. If I just go ahead and make one, I'll surely find someplace I need it. Right? Anyway, say hello to the Finea dresser! Four big, spacious drawers, modern design, and an open shelf to boot. Can I get an "ahhhhhh?" 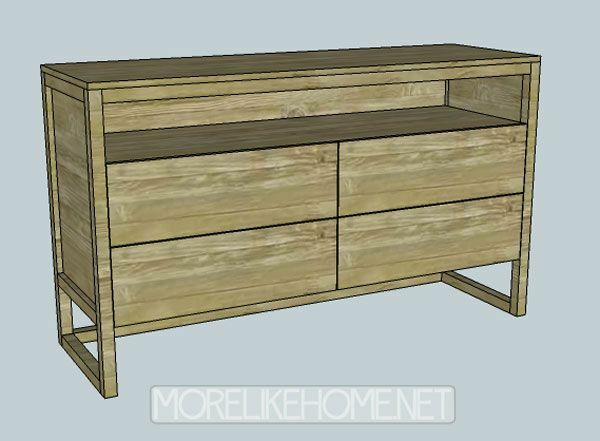 This guy is inspired by Crate & Barrels Linea dresser which retails for $1,700. 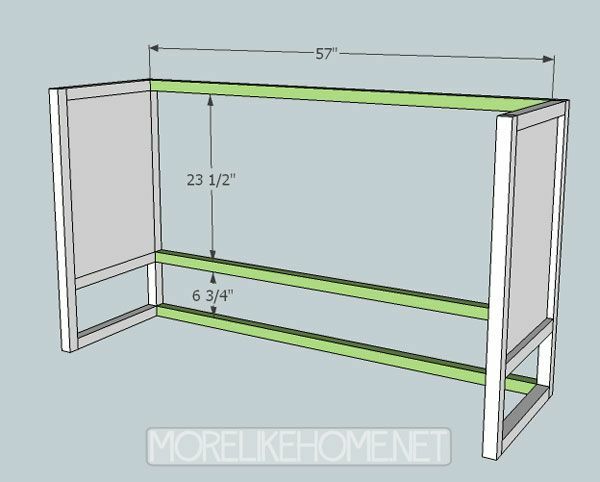 Want to build something similar for a fraction of the cost? Click "read more" for all the details! Please read all the directions before beginning, and cut your pieces as you go, measuring before each cut. Use 2” screws or pocket holes with 1 1/4" screws unless otherwise indicated. Always use glue. Pre-drill and countersink your screws. I have not built from these exact plans, so measure lots to make sure things work out! As you're building, it's better to make cuts as you go, measuring before each cut to make sure it's just the right size. But If you aren't able to handle a big sheet of plywood at home (or fit it in your car! 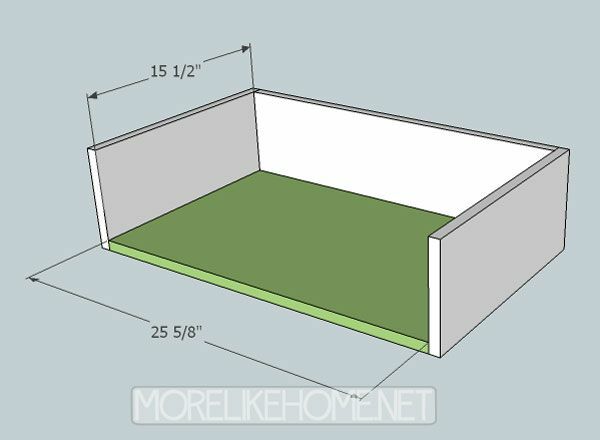 ), this is a diagram showing the best way to get all the pieces out of two sheets of 3/4" plywood (you'll have a pretty good size piece left over from the second sheet - hang onto it for your next project!). Lowe's will usually make your cuts for free, or for a small fee ($0.25/cut I believe). If you are able to cut at home, it may be better to use the diagram to cut the pieces as you go. Start by building the two end sections. For each end, attach two legs (G) using three side bars (H). Attach one side bar flush with the top of the legs, one 23 1/2" down from there, and the last one flush with the bottom of the legs. Attach them using a Kreg Jig, or by drilling through the legs into the end of each cross bar. Use glue. Next install the side panels (A). One will sit inside each side section you just built. You want the board to be flush with what will be the inside of the side section. This will leave about 3/4" of on inset on what will be the outside. 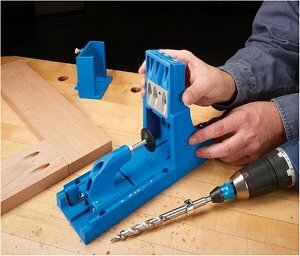 Attach it using a Kreg Jig, or by drilling through the legs and side bars into the side panel. Now connect the two side sections using the back bars (I). 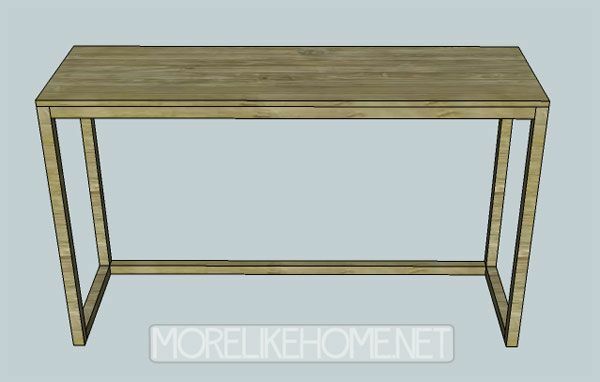 Attach one back bar flush with the top of the legs, one set down 23 1/2" from there, and one flush with bottom. This should line them up with the side bars. Attach them using a Kreg Jig, or by drilling through the legs into the end of each cross bar. Use glue. Then install the back panel (B). This will sit inside the top and middle back bars you just installed. 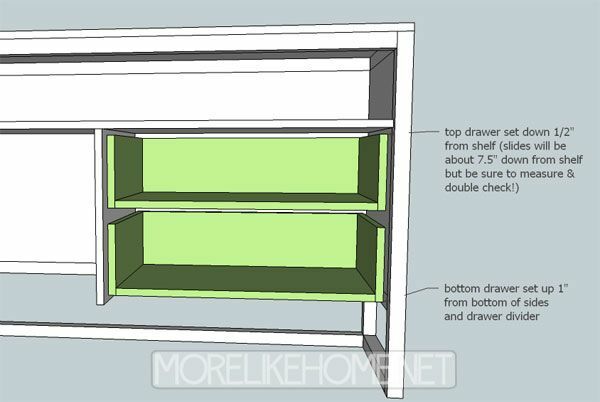 Like the side panels, you want it flush with the inside of the dresser which will leave about 3/4" inset on the outside. Attach it using a Kreg Jig, or by drilling through the legs and back bars into the back panel. Next attach the front bar (J). It should be flush with the top & front of the front legs. Attach them using a Kreg Jig, or by drilling through the legs into the end of each cross bar. Use glue. Then install the shelf (C). It should sit down 8" from the top edge of the legs and bars. Make sure it's level. 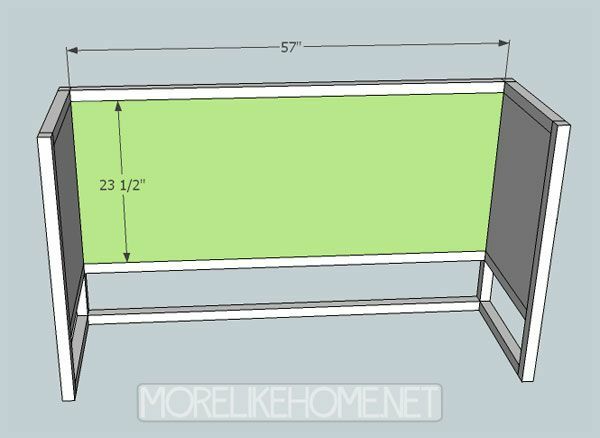 Attach it by drilling through the side & back panels and into the shelf, or use a Kreg Jig. 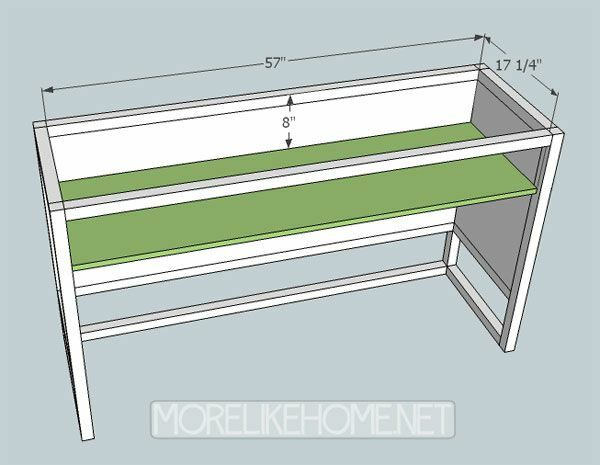 Start by using one drawer back (L) to connect two drawer sides (M). 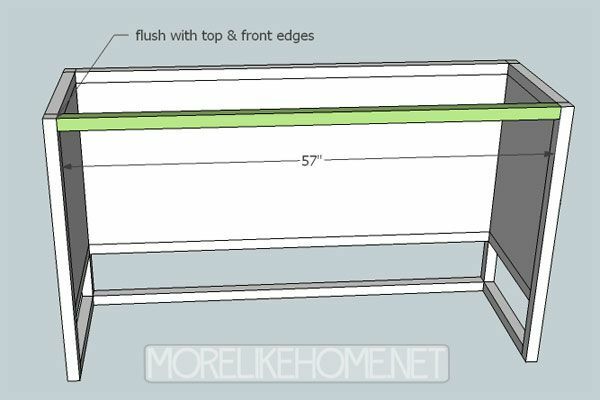 Keep the edges flush and attach the boards using a Kreg Jig or by drilling through the side boards into the back board. Now install the drawer bottom. 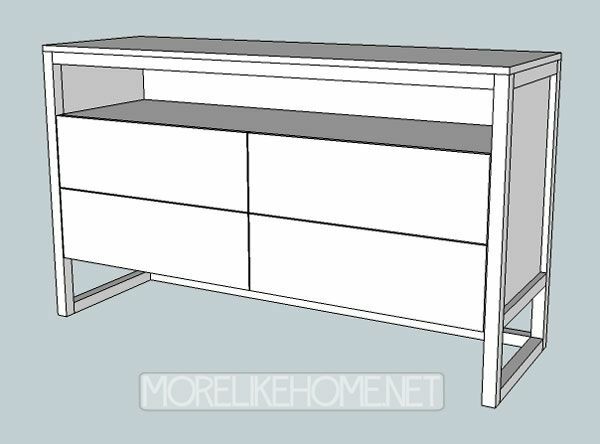 It should sit inside the frame you just built and be flush with the front edges of the drawer sides. If it sticks out at all past the sides you'll want to trim it down. Attach it using a Kreg Jig or by drilling through the sides and back into the bottom. 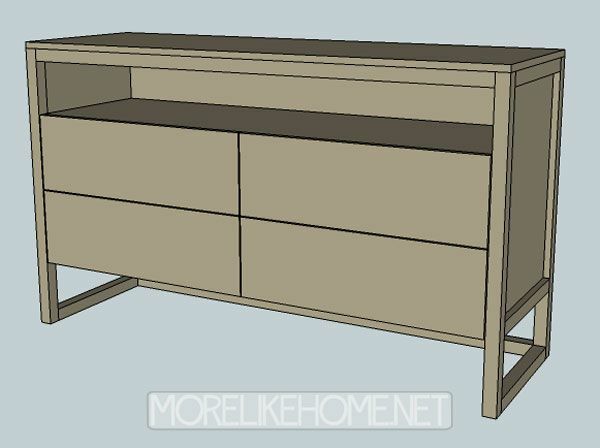 Repeat these two steps to build the other three drawer boxes. 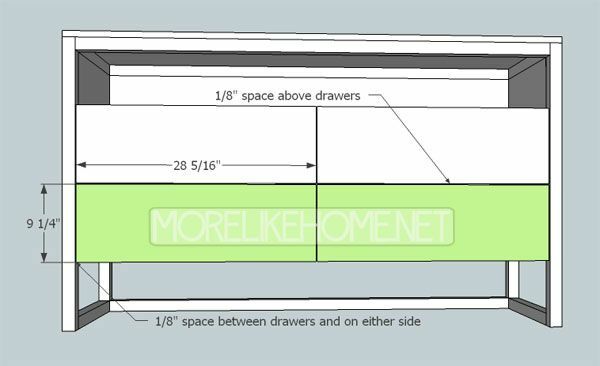 Once the boxes are installed, you can attach the drawer fronts (N). Let's start with the top drawers. 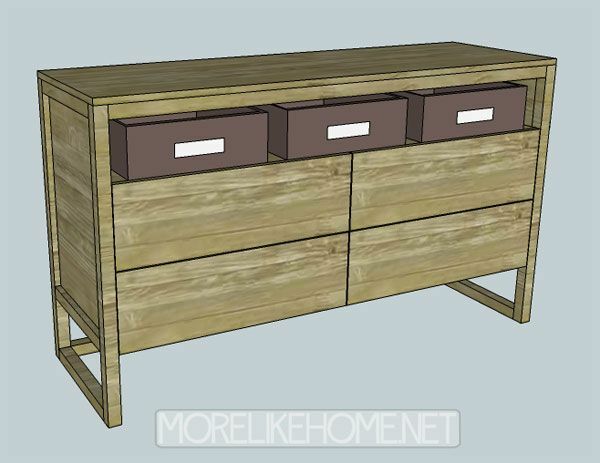 With the drawer boxes in place, line up a drawer front over it. 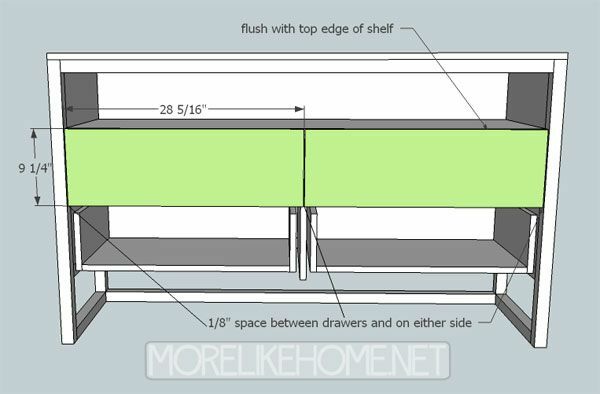 You want to line up the drawer front so it is flush with the top edge of the shelf, and leave 1/8" of space above between the drawer face and the leg (this will leave 1/8" between the two drawer fronts). 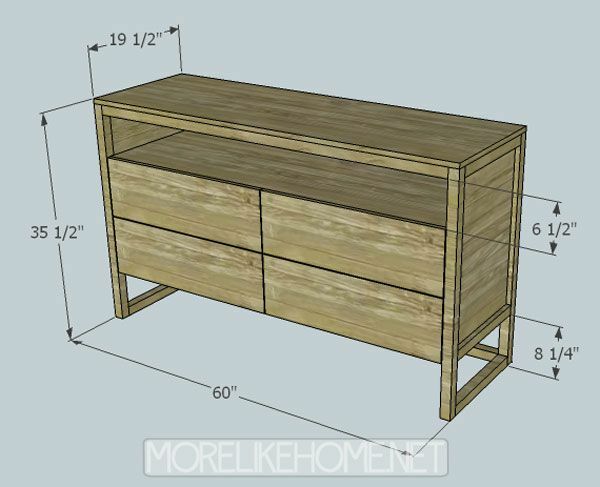 Once you have it in place, use a couple finishing nails & glue to attach it to the drawer box. 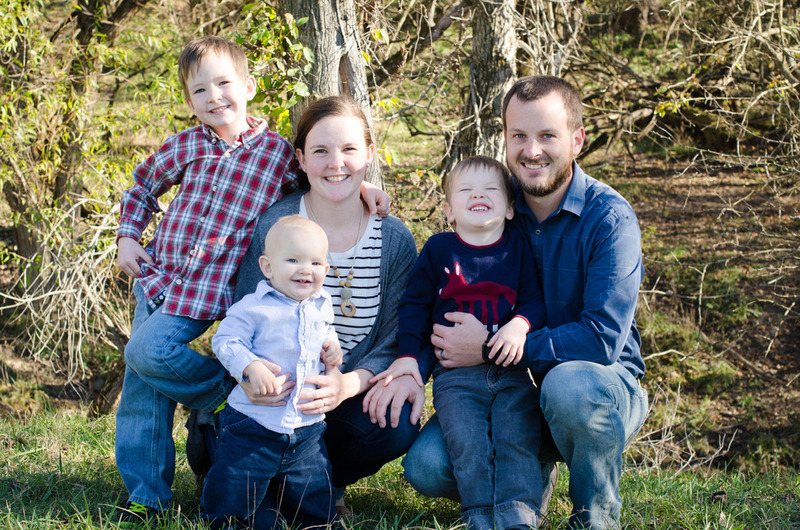 This is a great time to get an extra set of hands to help! 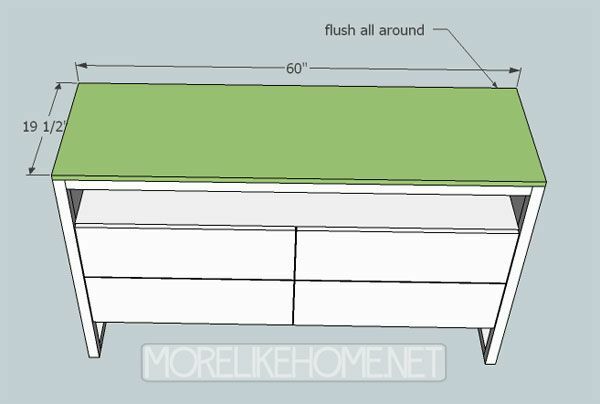 You may have an easier time lining it up if you lay the dresser down on its back. Once you get a few nails in to hold it in place, you can remove the whole drawer and set it on the floor to finish attaching the front with more nails. That way you can really hammer it good and now worry about the drawer slides. 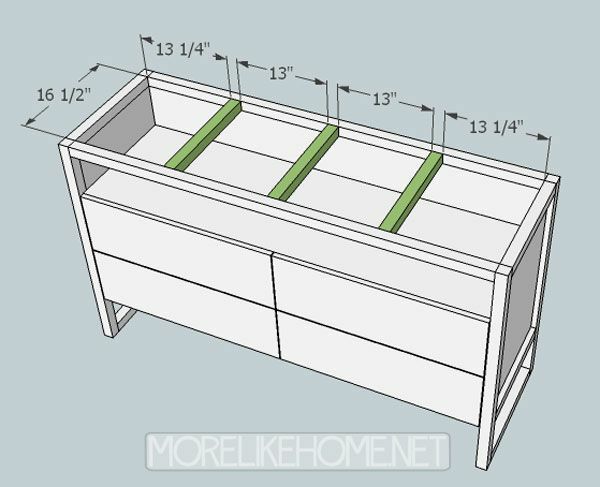 Then you can install the bottom drawer fronts (put the top drawers back in while you do this to make sure your spacing is right!). 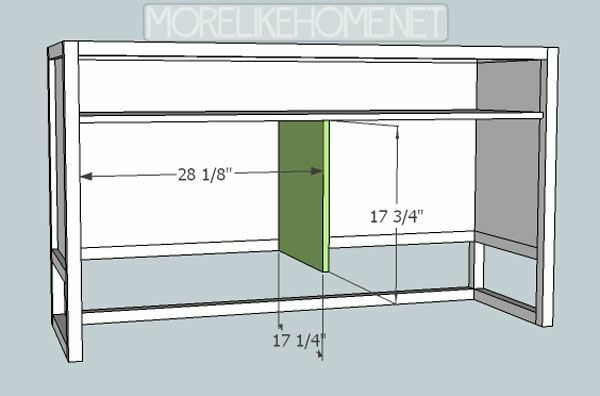 These drawer fronts should have 1/8" inch of space separating them from the legs, and from the drawer fronts above (which again leaves 1/8" between the two drawer fronts). You'll attach these drawer fronts in the same way with finishing nails. Start by installing the supports (K). You can just eyeball this to spread them across the the top opening, but if you want to be exact the measurements are in the pic. 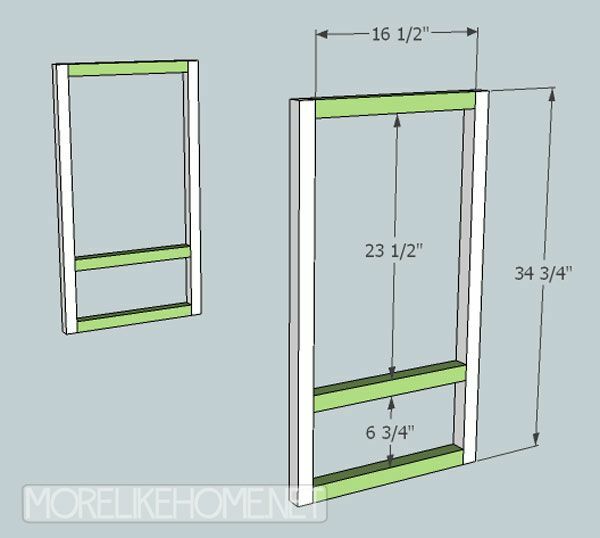 :) Install the supports using a Kreg Jig or by drilling through the front/back bars into the ends of the supports. Or try primer and a fresh coat of white paint. Or maybe a moody clay color. And don't forget about that shelf - it's perfect for baskets! The ones shown in the original are $20 each from Crate and Barrel, but you could even use shoe boxes covered in a pretty fabric! Anybody else get the CB catalogs? What's your favorite thing? Anything you would just LOVE to DIY? 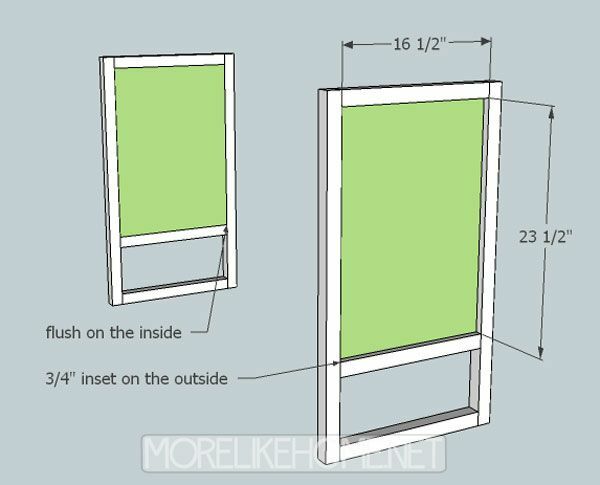 Neat project - I expect I might be building one for our bedroom! 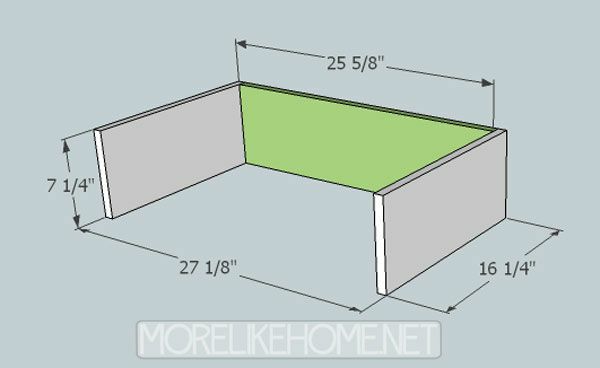 Another option for the top would be a pine project panel from Lowes or Home Depot. 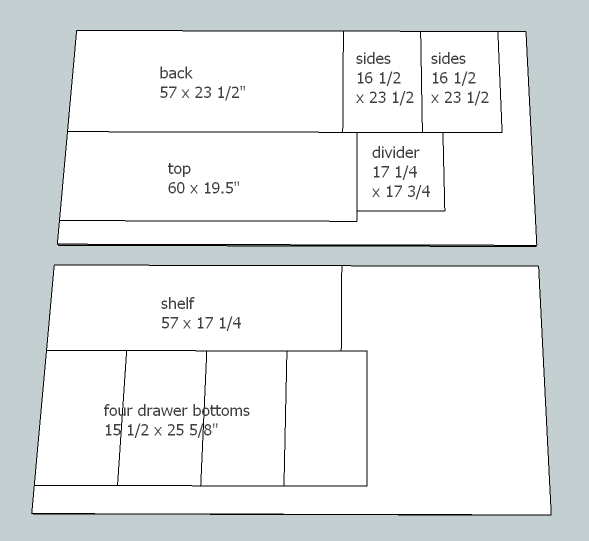 A 1"x24"x72" panel will run around $30; simple matter of ripping it to the desired dimensions with a table or circular saw (or again they might be able to do this at the store). Thanks for the design! This would be great in the living room. It could hold so many things handy without having piles clutter the room.